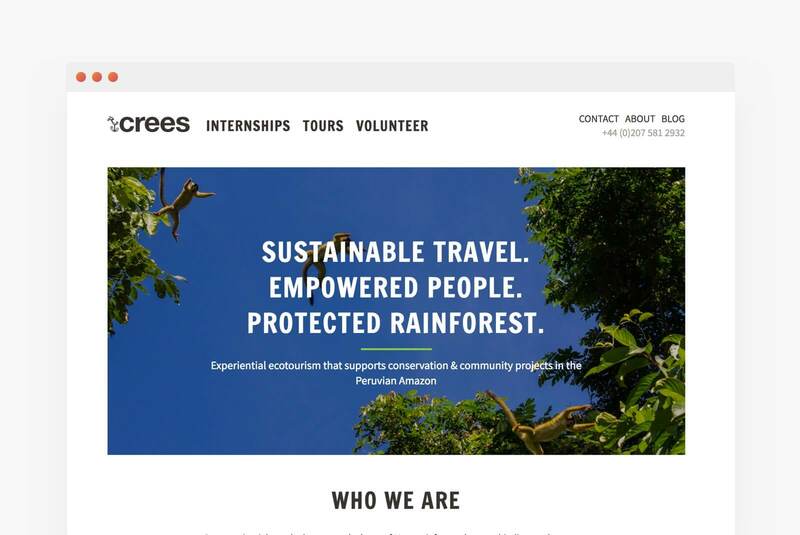 Crees Manu is a not-for-profit organisation on a mission to support a more sustainable Amazon through experiential ecotourism. Based in Peru, Crees is committed to empowering the people of Manu through sustainable livelihoods and improved living standards. 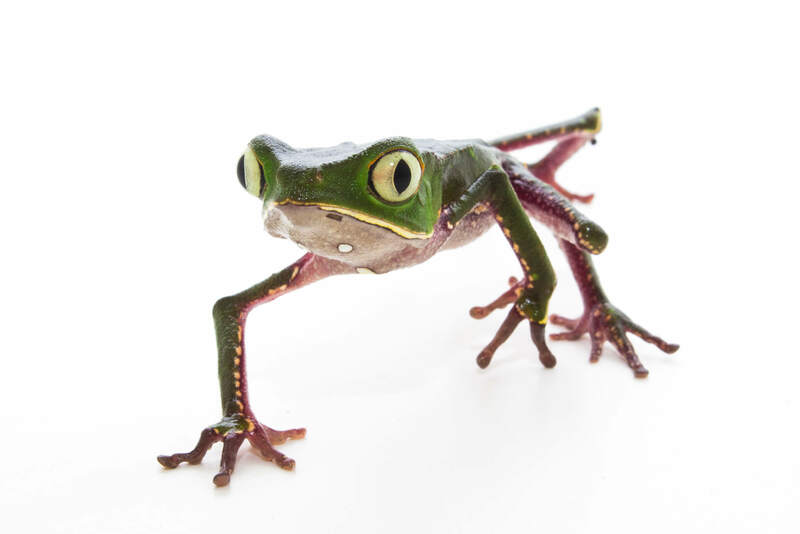 All of their experiential ecotourism experiences – from internships to tours and volunteer opportunities – support local conservation and community projects. Every project contributes to a more secure future for people and nature, by supporting a more sustainable Amazon for us all. 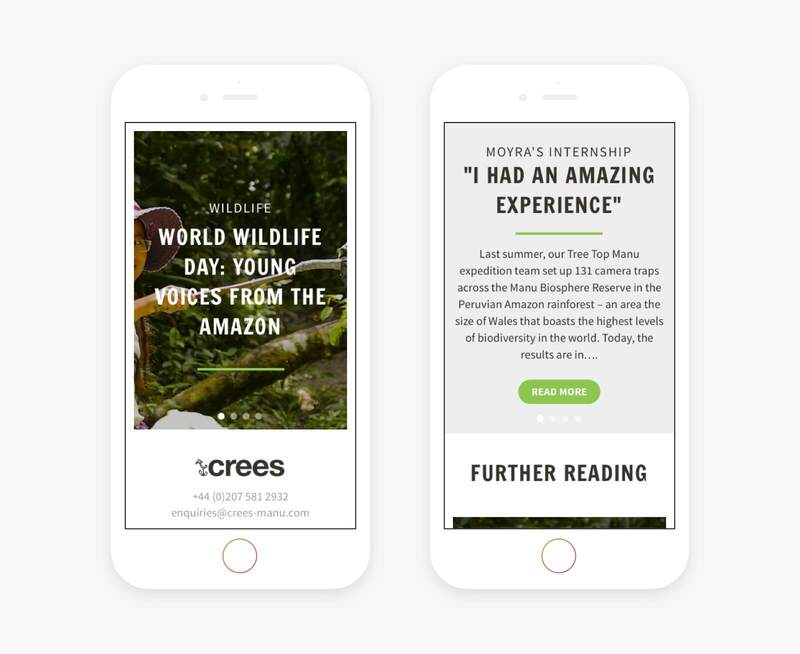 We initially started working with Crees on updates to their old site, which saw an average of a little more than 3,000 visitors per month. 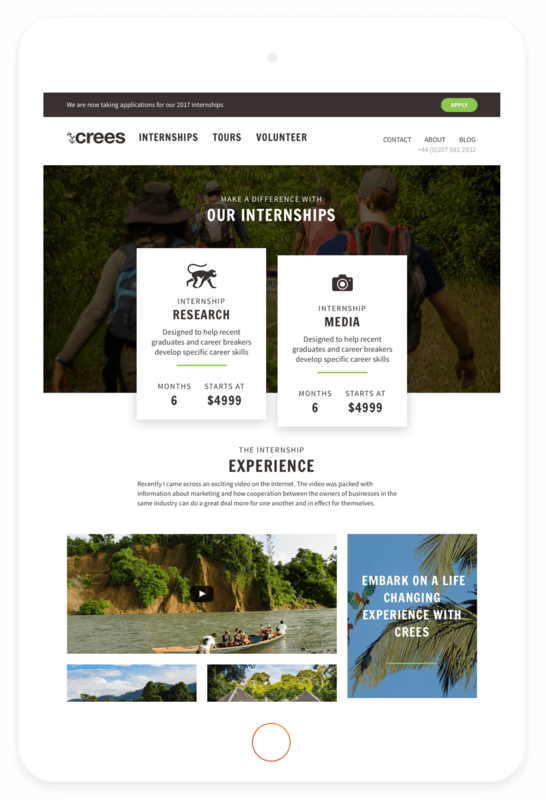 Crees’ old website was not built by us and was regularly hacked, which increased their site’s vulnerability during updates and meant a lot of time was spent fixing the site rather than moving it forwards to generate more leads. This meant their ROI was low, as they were spending money on a site that wasn’t technically healthy. Following discussions about the health of the old site, we advised it would be more cost effective in the long run to start anew with a fresh website, designed with their typical users in mind, to increase their ROI. Before approaching the design phase of the new website, we first started with an extensive in-depth focus on building understanding around its different users, to ensure we created a design that would resonate with Crees’ intended audience. This discovery phase took place over three weeks, with our designer and project manager working closely with the Crees’ team to first establish the identities of all existing and potential site visitors and their needs at each stage of their visit. Involving all parties at the initial stage was vital to build our relationship with this client, and to ensure we had a strong foundational understanding of users’ requirements in order to create an empathic design that would have real impact. We worked collaboratively with Crees throughout the design process, reflecting back on the needs of each of the identified user personas, at each stage of considering any new element of the site. We shared the wireframes at regular intervals, having multiple rounds of feedback to ensure we were on track before finalising them and moving on to the design phase. The team at Crees also worked closely with us during the design phase, meeting with us regularly both in person and via Skype, to benchmark how people would interact with our templates. We spent a month on design and feedback, considering questions like: “How would ‘Media Megan’ view the internship page?”, “Does it suit her accessibility requirements and is content clear for her?” and “Are there too many click-throughs to non-relevant information?” for each identified user. These discussions helped us to create a design that would land well with all audiences. Once the designs were approved, we quickly began the development phase. The new website was created using ACF and SiteOrigin Page Builder to offer flexibility, allowing the Crees team to easily edit all the content on the site. Extensive training was given over a combination of channels, both in person and via phone and Skype calls, providing in-depth support to ensure all those using the site would be confident in adding or making any changes to the content in future. Within a week of launching the new, more user-focused website, the number of site visits went up by more than 70%, and a new lead was generated within the first hour of launching. We have developed a strong ongoing relationship with Crees, and look forward to updating their new website to make sure it remains relevant to their intended audience.